Nick Browne made his fifth first-class century of the season as Essex registered an final-session five-wicket win over Leicestershire at Grace Road. Leicestershire, resuming on 222-5, added 29 runs and lost two wickets before declaring at 251-7. Essex then halted their first innings at 18-0, before Leicestershire batted and again declared on 79-0. Set 307 for victory, Browne's career-best score of 151 and partnership with Ravi Bopara (69) secured victory. Essex lost Dan Lawrence (28) early when he edged Ben Raine (2-73) to first slip, before Tom Westley was caught at point for one. Despite being dropped in consecutive balls by Angus Robson off Rob Sayer at slip, Bopara went on to compile his highest score of the Championship season. 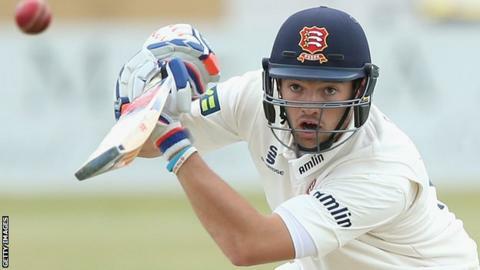 Browne became the first Essex player to reach 1,000 Championship runs in a season since Bopara in 2008, before bad light interrupted Essex's chase. Following the resumption, Essex lost Ryan ten Doeschate (28) and Jesse Ryder, but Browne and Mark Pettini (13 not out) upped their pace to beat the gloom, reaching the target with 2.1 overs to spare to register their side's sixth Championship victory of the season. It is also the third year running that Leicestershire will finish bottom of the Division Two table.